EconomicPolicyJournal.com: Will Trump Name Stephen Moore Fed Chairman If the Senate Confirms Him for the Fed Board? 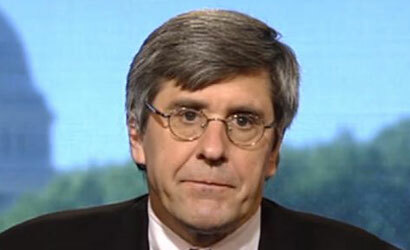 Will Trump Name Stephen Moore Fed Chairman If the Senate Confirms Him for the Fed Board? Is Trump Considering Replacing Jay Powell as Head of the Fed? There appears to be pretty much general consensus amongst those who interpret bureaucratic legalese that President Trump can't fire Federal Reserve Board Chairman Jay Powell as head of the Fed. BUT, and this is important, he can keep him on the board but replace him with another member as Fed chairman. Reports continue that Trump is not happy with Powell, even though from an outside perspective it appears Powell has become Trump's lap dog--if not a Ragdoll cat. The Ragdoll cat is carefully bred to produce large affectionate animals...Ragdoll cats tend to be more interested in humans than some breeds of cats. They are known to run to greet you at the door, follow you from room to room, flop on you, sleep with you, and generally choose to be where you are. Many Ragdolls have been taught to come when called and play fetch. They are gentle cats, and usually play without extending their claws. Sounds like Powell to me. But this does not seem to be enough for Trump. According to Politico, Trump reportedly unleashed his latest criticism on Powell in a meeting with House Republicans on Tuesday, saying Powell has “no feel” for the economy. Trump has appointed four of the five current Fed board members, including Powell and would have a fifth member in Stephen Moore. Moore is a rabid inflationist. He told The New York Times last year that he thought the Fed should "immediately reverse course and cut rates by half a percentage point." In a new NYT interview, he said he was correct to make that statement. If Moore is approved by the Senate, it is possible that Trump would push Moore into the Fed chair seat and then we will be off to a remarkable explosion in money supply growth. It is not clear, however, if Moore will be approved. There is almost universal condemnation in the economics community of Moore. So there is backlash but it is not clear if the negative view of Moore extends to the controlling Republican-side of the Senate. Indeed, I am not hearing reports of any objections to the nomination. I mention this because the Washington Post economics columnist Robert J. Samuelson is making the same point in his latest column. And his warning is so dire about an outcome of Moore heading the Fed that I am sure this Monday morning he will get offers from top investment newsletter publishers for a gig, if he can keep up the fear mongering. Of course, Samuelson is an inside the beltway columnist and no doubt the Fed PR team has his phone number on cell phone speed dial but it wouldn't take much too nudge Samuelson in this case. He is a pretty solid observer and his warning about Moore is correct. If Trump were to replace Powell with Moore, the stock market on the news would probably drop by between 10% and 20%. Why would the stock market drop with a Moore appointment? The stock market loves inflationists, at least in the early stages of the disease; the punch bowl would just get a wee bit bigger with Moore.